I took an interesting online quiz the other day. Well, technically it wasn’t a quiz, but it was still interesting. 31 Signs You’re a Portland Native. Now, I’m not actually a Portland native. I moved to the Pacific Northwest in 1994, when I was 25 years old. And though I’ve lived here for nearly twenty years, only fifteen months were actually spent in Oregon. My home is located across the river, in Vancouver, Washington. But it feels like I am more a Portland native than probably half of the people who actually were born and raised there. The city – with apologies to Rod Stewart – is in my heart and in my soul. I feel a kinship with it, and believe it helps define my identity. Plus, I “scored” 18 out of 31 anyway. I know how to pronounce Couch Street. I do not own an umbrella. I don’t understand why every bookstore isn’t like Powell’s. And yes, I “love love love” my city. If there’s such a thing as being a “native at heart,” then I’ve got everybody else beat. Turn of the century hitching post. Those are hitching rings, solid posts embedded in concrete and installed shortly after the turn of the century. 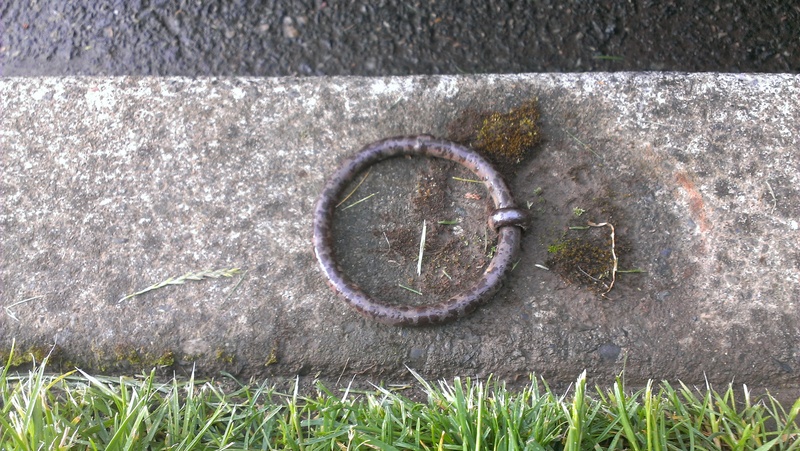 People tied their horses to those rings, and in true Portland style, people still tie horses to them – only they’re usually tiny and stuffed. These things are scattered all over the city, and offer a great glimpse into the past. How cool is that? Which is not to say I don’t like Vancouver or am not happy here. Nothing could be further from the truth. This is a great little community, with lots of history of its own (oldest settlement west of the Mississippi, original home of the Hudson’s Bay Company at Fort Vancouver, etc.). It’s got a great small-town vibe with plenty of amenities, and is just a short drive from Portland. We have easy access to all of the culture the Rose City has to offer, without the income tax. And we are allowed to pump our own gas. In many ways, Vancouver is the perfect place to live, and if Tara and I end up buying a house here and settling down, I’ll be nothing but happy. The important thing is just being together. Can I come to Portland if I work as your maid? I love Portland. Enjoy Laurelhurst Park for me this summer! Maybe sneak in a stop to Pine State Biscuits while you’re at it. You have great timing, Jess. Tara was just suggesting we hire a maid to come in maybe once a month to help with some of the deep cleaning. You’ve got first dibs at the job if you want it! Love Pine State Biscuits. Haven’t had a Reggie in ages, and now I’m craving one! Pretty sure Tara also said she would NEVER get married again either!!!!!!! Keep the hope Mark! Now THAT is an excellent point, Wendy! Not only did she say that, she hammered that point home repeatedly. There’s hope for me yet! I’m the same as you, Mark. I prefer living in places that are more eclectic and less cookie-cutter. Portland sounds a lot like certain parts of Philadelphia; that older and more vintage feel. I like being around old things because the have more charm. Yup…we have those in Society Hill, which is the oldest part of Philadelphia. We also have areas that are still cobbled stone. I feel the same way about NYC, that you feel about Portland. Even though I wasn’t born there, it’s home in my heart! Have a faaaaaabulous weekend, buddy! I love the personality an older house (and by extension, neighborhood) has. There was just so much attention paid to detail. Hardwood floors, glass door knobs, wainscoting, things like that. Sure, there’s some upkeep involved, but that’s the price you pay for owning something constructed so solidly. So me, you & Madame Weebles all had the same idea this week – explaining why we live where we live & why! I hope you get to live in Portland in the near future. Just make Tara fall in love with a house & you’re there! I was partially inspired by your post, but I didn’t even get to the WHY I am living here part yet. I talked about why I love it here, but not why I ended up here. I had intended to talk about that in this post, but it was already getting pretty long, and I figured that can be a separate post instead. I can understand her ‘why’ of not wanting to move over there. You automatically lose 10%+ of your income and you pay more for gas since you can’t pump it yourself. There are other reasons but living in Vancouver is like living in both worlds but only better. So put a hitching post out front, buy a stuffed horse (preferably the one from Rainbow Brite) and enjoy the simpler life you have in Vancouver. Well, the income tax only applies if you are working in Portland. If we still had jobs in Vancouver, that wouldn’t be an issue. Of course, we’d probably want jobs in Portland anyway to be closer to home, so there is that trade-off. I’ve often said living in Vancouver is having the best of both worlds, and that’s pretty close to the truth.